1969 was a one of a kind year from 350,000 people going to a New York farm to see Woodstock or as we all sat in-front of our TV's and watched Neal Armstrong make. "That's one small step for man, one giant leap for mankind." The Beatles release Abbey Road. John Wayne Is Starring In True Grit and Butch Cassidy and the Sundance Kid are showing at the drive in. Now the big thing for 1969 was the Muscle car war's were in full swing. With The Introduction of some of the most iconic names in history. The masterminds over at Pontiac wanted something that no one would ever forget so here comes the Judge the most powerful GTO ever put on the assembly line. Over the years The Judge's have become some of the most collectible car's of all time. 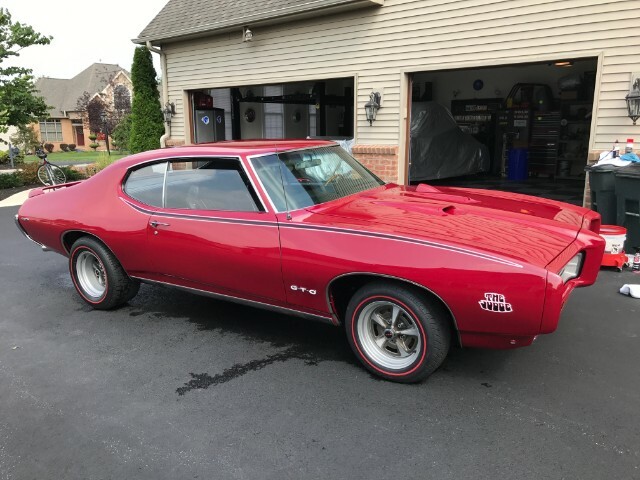 This 1969 GTO Judge is out of a private collection and it is a very rare and sought after Goat. After a very instinctive complete frame off restoration we have an all numbers matching, highly documented, professionally restored Judge. This is a Rare Matador Red Non vinyl roof car only 15 produced in this color, 400 Ram Air lll, four speed with 3:55 posi, all original sheet metal car. Everything on this car has been restored to perfect, original condition or is replaced with new components. This project started with a very clean all original body and was stripped all the way down. No expense or time was spared to make it slick as glass and arrow straight. The body lines and gaps are perfect. It is painted the original Matador Red with base coat clear with a ton of time wet sanding and buffing. The bodywork and paint are amazing. It looks awesome and fits together better than from the factory. This car only has 25 test miles since being completed just to make sure everything work properly...it is brand new! Here are the Details. Original, numbers matching 400 Ram Air lll completely rebuilt Factory 4 speed manual transmission, All new hoses, clamps, wiring, etc. Powdercoated frame, suspension,3:55 posi-traction rear end,Power disk brakes, Factory black interior - fully restored, Rally wheels with redline tires, New stainless fuel lines front to back, New stainless brake lines front to back, Power steering, New brake lines, Look at build sheet for more options, Highly documented. This car was built with no expenses spared. EVERYTHING WORKS: All lights work, horn works, wipers work, heater, etc.Feel free to ask questions. I do not need to sell the car and will not give it away, but someone will buy the for FAR less than you can build one. Feel free to make an offer.I bought another toy and would like the room. I have a clean, clear title in my name with no lien. Inspections in person are encouraged. The car is finished and Ready to Go to it's New Home. Call For More information. Message: Thought you might be interested in this 1969 Pontiac GTO Judge.